ESET has chosen the Mindmatrix channel enablement platform to power its new partner portal, the ESET Marketing Center. IT security software provider, ESET has chosen the Mindmatrix channel enablement platform to power its new partner portal, the ESET Marketing Center. The ESET Marketing Center provides access to ESET’s partners and resellers in North America, through MIndmatrix, at no cost. 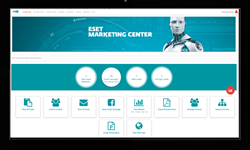 ESET partners can use the new ESET Marketing Center to brand content and resources, deploy email campaigns and manage their prospect database, all from one easy-to-use console offered by Mindmatrix. Once the partner sets up their profile, all assets are automatically co-branded and tracked back to the partner allowing them to review data and manage leads. Partners retain full control and privacy of their customer and prospect database. Mindmatrix is a complete end-to-end channel enablement platform comprising channel marketing automation platform, channel sales enablement and PRM. Mindmatrix CEO, Harbinder Khera said, "At the core of driving channel partner relationship success is helping channel partners sell and market better. Partners are too busy working in the business to work on it. Vendors need to provide channel partners with ready-to-use tools and resources to help them build their brand in the local market. Mindmatrix is very excited to help ESET make their partners successful utilizing the ESET Marketing Center!" For 30 years, ESET® has been developing industry-leading IT security software and services for businesses and consumers worldwide. With solutions ranging from endpoint and mobile security to encryption and two-factor authentication, ESET unobtrusively protects and monitors 24/7, updating defenses in real time to keep users safe and businesses running without interruption. Backed by R&D facilities worldwide, ESET became the first IT security company to earn 100 Virus Bulletin VB100 awards, identifying every single “in the wild” malware without interruption since 2003.